Nine year old Aimee Butler loves fairies. 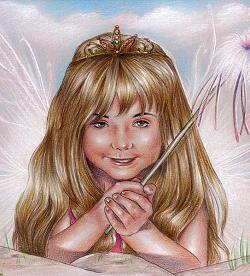 Like any other girl of her age Aimee has searched for fairies at the bottom of her garden. And fairies do indeed live in the bottom of Aimee’s garden … and many, many more besides live in her house too. Aimee’s world of fairies has a special and unique place in her young life – on the front-line in her battle with childhood leukaemia. Aimee was first diagnosed with leukaemia when she was five. Following two and a half years of chemotherapy and almost a year off treatment, suddenly and expectedly Aimee suffered a devastating relapse at the beginning of 2004. 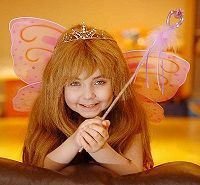 Throughout 2004 fairies from around the world – in all shapes, sizes and disguises - have been by her side through the endless rounds of treatments needed to bring the cancer back into remission. In the spring they flew in droves to help cheer her when – weakened by chemotherapy - she developed pneumonia. In the summer they sprinkled her with fairy dust when a worldwide search for a bone marrow donor found her a much needed one-in-a-million match. 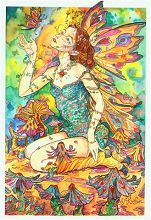 As autumn approached ever more globe trotting fairies endowed with fairy healing gathered around her as she went through a bone marrow transplant to fulfil fairies wishes for a new life full of fun, laughter and good health. Now as Christmas approaches Aimee’s fairy magic continues to deepen and extend its mystical and spellbinding effect on those who love her and those who are close to her. 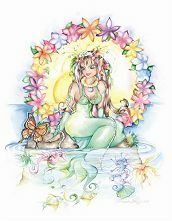 This is a fairy magic that grows ever more boundless - spreading its wings to bring cheer and comfort to other very sick children and light and healing to their families in their most difficult moments. Aimee and I have learned that fairies so often walk in human shoes. Although we express our sincere and grateful thanks a thousand times over each day – it never seems enough - especially for that one very special “fairy” with the knowledge and the motivation to become Aimee’s bone marrow donor. So many other “fairy folk” have been vitally important too – a list that is equal in size to Santa’s own “nice list” – bringing an endless support that has been pivotal in helping Aimee gain a much swifter and more sound recovery than had thus far been expected. We none of us know what tomorrow may bring – for good or for ill. Neither do we know what help we may need to find the strength to continue our journey. Aimee and I have humbly unlearned our childhood lessons that we must always be self-sufficient and forever independent. We have learned in times of great need to accept and cherish the many gifts and forms that make up human love and compassion. We have also learned that for moment… today is good enough.